Yerachmiel Begun Presents: BENNY & THE TORAH KIDZ! BENNY & THE TORAH KIDZ! Raise your Torah FlagAnnouncing a breakthrough in children’s family music! KIDZ and their leader singing for children! An amazing all new, all English children’s CD to be enjoyed by children of all ages and entire families ! Yerachmiel Begun, the legendary composer and director of the Miami Boys Choir has created an amazing new dimension in young children’s music. He composed new songs and his wife Shoshana wrote the lyrics; simple enough for young children to enjoy and learn great Torah ideals, yet smart and sophisticated enough for everyone else in the family! With such new fresh happy and hopeful themes in songs such as Raise Your Torah Flag (for Simchas Torah), Tomorrow is another Day, Wake up, The Wonders of Hashem, The Shabbos Day and much more – including songs for Chanukah & Pesach. All sung and acted so expressively and professionally by 4 Miami Boys Choir members and their leader Benny. The CD is distributed by Concord Music. Coming this week to stores and online. Watch out soon for the announcement about their upcoming NY-NJ Chol Hamoed Succos shows – followed by select USA performances this winter. 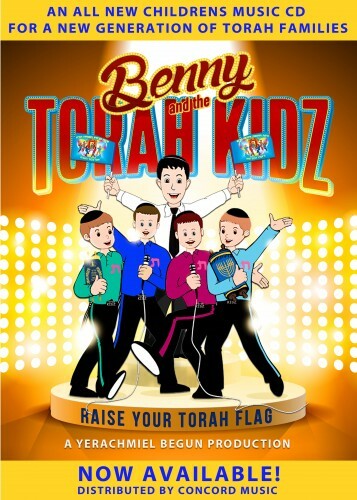 Benny & The Torah Kidz: An all new children’s group & cd for a new generation of Torah families. Enjoy this audio sampler with footage from the Torah KIDZ Live in Concert!